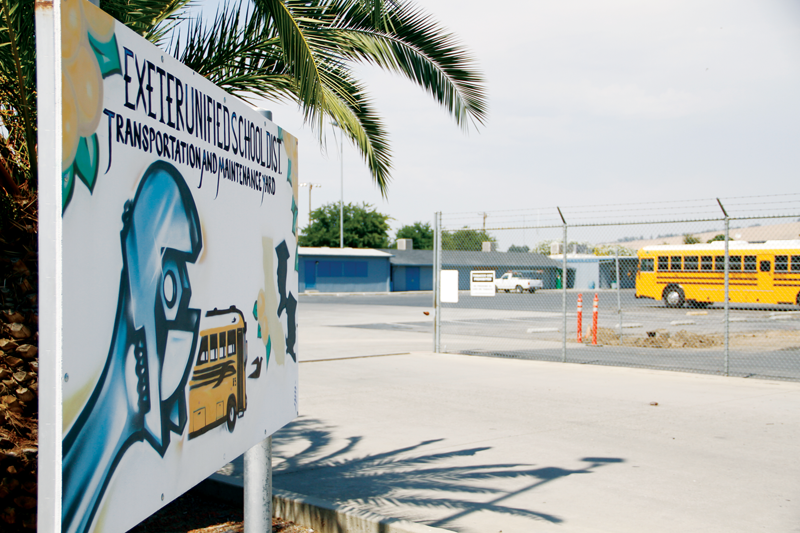 EXETER– Exeter property owners are beginning to see the latest returns on their $18 million Measure K bond investment, passed in 2016. On Monday, Sept. 10 Exeter Unified School District trustee members, administrators and employees enjoyed a complementary luncheon of tacos and soft drinks to celebrate the grand opening of the improved transportation yard on Rocky Hill Drive. The $2.2 million improvement project furnished the yard with a new compressed natural gas (CNG) filling station, canopies for busses to park under complete with solar panels. Hire said that energy from the solar panels are projected to nearly zero out the energy needed to run Kaweah High School and the transportation facility. “That’s where you generate the savings. The hope is that these savings pay off the project,” Hire said. The project was anticipated to cost $2.7 million on the outset, but thanks of a $500,000 grant from the California Energy Commission, the District only allocated $2.2 million from the Measure K bond. The first six years of solar panel generated energy is expected to save the district $450,000 with $25,000 coming from the first year. Hire did add that savings on CNG is tougher to quantify than energy savings, because of the fluctuations in cost. But he did note that having an onsite CNG station will make better use of staff time. As of now the District has five CNG powered buses but in order to fill the buses for a full day, transportation staff would have to drive the bus to the Exeter City Yard or the Visalia Unified School District’s transportation facility to use their filling stations. And according to Hire it takes a significant amount of time to fill the tank which is why they filled them over night. As well, when a driver drives the bus to the city yard or the VUSD transportation facility there was a second driver there to drive them back. Exeter’s onsite CNG station has eight hoses to their five CNG buses. The District hopes to expand their CNG bus fleetand needed the capacity in case it happens. The District has also benefited from electric vehicles in the past with San Joaquin Valley Air Pollution Control District (SJVAPCD) grants that have yielded hybrid and electric Ford Fusions, carts and Gators.